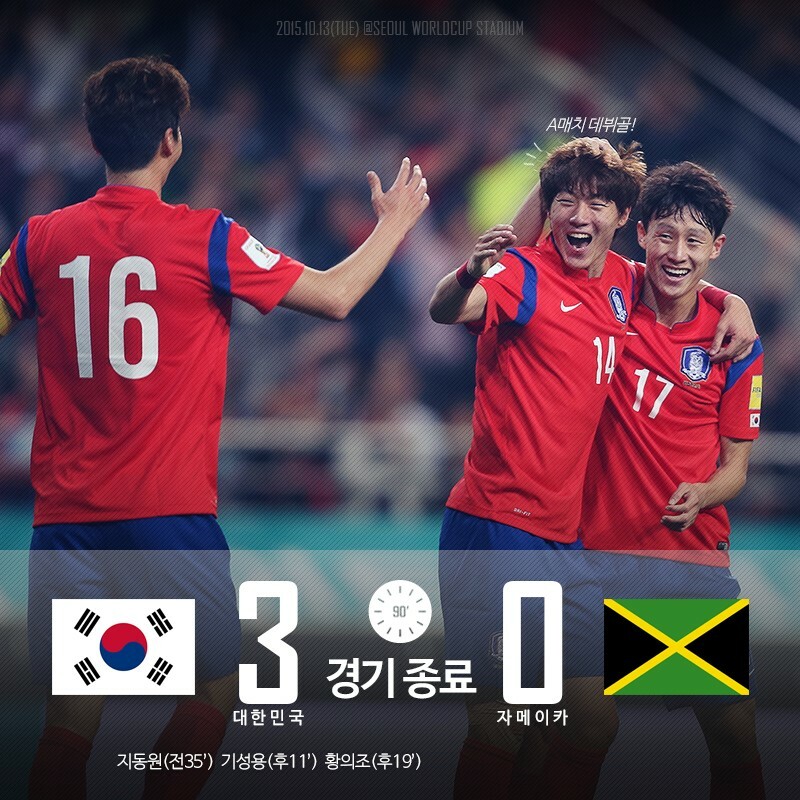 Earlier this morning (or last night if you’re reading from Korea) our beloved KNT defeated Jamaica – the team that knocked out the USA in the recent Gold Cup – on home turf. There was not much hype leading up to this game – Stielike specifically said he was going to rotate after the ever-so-important Kuwait game, and the Reggae Boyz flew in from a nearly 12-15 hour flight and didn’t even bring their A squad. Naturally, the Tavern crew expected the Jamaican B team barely trouble us at all. And our prediction was right – in fact I think Kuwait was the much tougher opponent, though that makes sense since 1. Kuwait didn’t fly for half a day and 2. it was Kuwait’s home stadium. Read on for more details! An interesting lineup here – Seongnam striker Hwang Eui Jo came back into the mix; we see a very defensive double 6 in Han Kook Young and Jung Woo Young (which I personally don’t approve of); Kim Chang Soo and Kim Ki Hee came back into the mix; JDW started once again, determined to FINALLY score his first goal in 4 years. From the onset we were hardly tested. In the first half, we took the lead when our favorite Tuna (Dongwon = 동원참치 the canned tuna brand) finally managed to score his first goal in literally forever thanks to a cross from Jung Woo Young. In fact I thought this comment on Facebook was the funniest thing: “냉동참치도 녹여버리는 슈틸리케의 매직,” which refers to how Stielike’s magic can even make frozen tuna melt. A slight mistake from the goalkeeper, yes, but we’ll take it! Ji Dong Won seriously needed that boost of confidence. And you could tell – he was active and taking shots literally all game! Will he finally start scoring for Augsburg now? In the second half he even earned us a PK, which KSY coolly slotted into the bottom left corner. As for the rest of the match, we were, unsurprisingly, wasteful in front of goal. We should have scored more, but… typical KNT right? As for individual players… I don’t think a single player really disappointed, aside from maybe Kim Chang Soo who wasn’t as effective Jang Hyun Soo has been as RB. HKY and JWY didn’t have too much work, and the CB’s weren’t tested that much either. 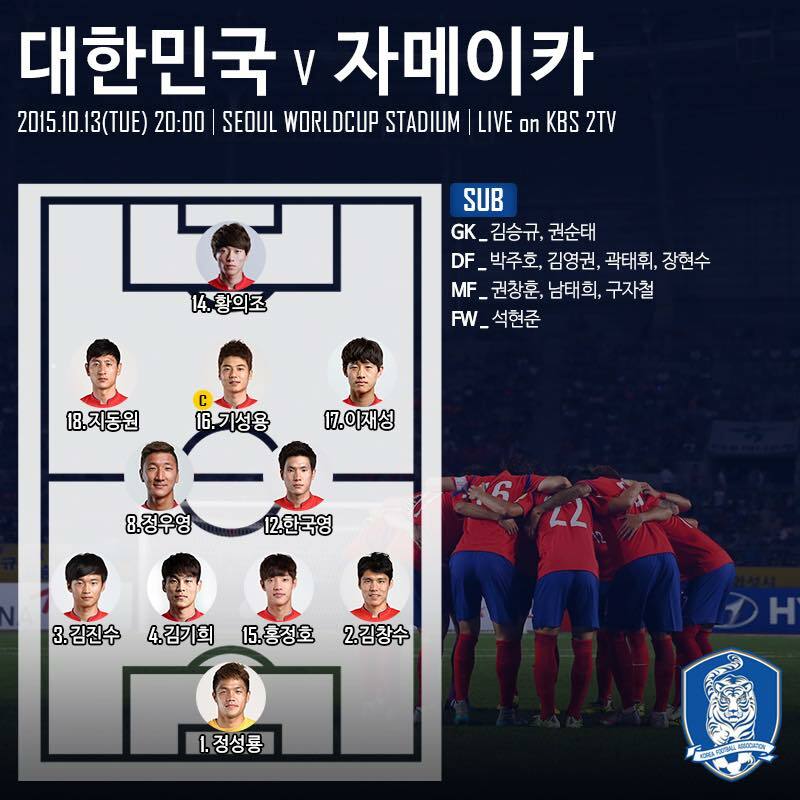 Kim Jin Su, Lee Jae Sung, Ji Dong Won, and Hwang Eui Jo I thought were my standouts for the game. LJS and KSY hardly disappoint, and I was slightly worried about KJS due to his starting XI spot having been taken over by Jeremy Toljan, but he was very good in both attack and defense. Now I don’t know about you guys, but Jae seems to agree with me on this one – from the very first set of friendlies when both SHJ and HEJ were called up (I believe it was Laos), I actually liked Hwang Eui Jo SLIGHTLY better than Suk Hyun Jun. As a whole the KNT fandom (and Stielike) seem to disagree, and maybe this is an artifact of the fact that the Jamaica game was so much easier than the Kuwait game, in which Suk did ok but not that well. I’ve found myself liking Hwang’s aggressiveness and off the ball movement quite a bit – not only that, he takes a LOT of shots, hitting the crossbar once. One of my major complaints with the KNT has been not taking shots when we have a clear shot available, but Hwang doesn’t have that “oh I might mess up better pass” mentality. To be honest the real value from this match was 1. more time for the team to gel and more importantly, 2. confidence booster, especially when it comes to Ji DW and Hwang EJ – they really needed it. Speaking of confidence boosters… I think we’ve had our fair share of them. With all the Asian minnows coming up for the rest of the 2nd round and the upcoming 3rd round of WC qualifying, perhaps we should focus on the “ruthless goalscoring mentality” by practicing scoring mercilessly against weaker opponents – something we couldn’t consistently do in the past (see the last minute Qatar win, losses to Lebanon, Uzbekistan draws, and last minute wins to Kuwait). But Stielike’s tenure so far has a perfect record against “weaker” teams, and the trend continues: if we win a game, we win with a clean sheet. We score a lot vs Asian minnows (FINALLY) and can comfortably win games that in the past we’d certainly struggle with. Which makes me feel that it’s time to start playing more difficult opponents from across the globe – maybe the next step in our development is to play “mid-tier” teams from the other confederations like Switzerland, Ecuador, USA, Iceland, Peru, Denmark, etc. (as for South America we’re certainly above Paraguay, Bolivia, Venezuela, etc.’s levels but we’d get wrecked by say Colombia, Chile, etc.). If Europe, we should always try to play away because we have so little practice playing away and tend to play a lot better at home (though I suspect it’s all the traveling that our opponents go through). And it’s certainly too early to test ourselves against teams like Argentina or Germany or whatnot. One more important point I want to share: we really are stronger attacking down the left than down the right. I first came across this point while watching the 원투펀치 analysis on the Kuwait game. Quick Digression – I watch every single one of these one-two-punch analyses from Han Joon Hee and Jang Ji Hyun – they’re truly one of the kings of football analyses in Korea alongside Lee Young Pyo. If you haven’t subscribed to the Youtube Channel 원투펀치, do it right now. I’ve been a subscriber for years and man their insights are actually ingenius. And while watching this they brought this point up that our attacks from the left tend to be stronger than the attacks from our right side. It’s not the first time, they’ve said this since if you think about it it’s been true for a while now, but it really resounded with me because looking at the replay of the game (I was in lab while the game was going on) I felt it on so many attacks. Why? Because Kim Jin Su is just a better player than Kim Chang Soo. And IMO Park Joo Ho is better than both of them. Which I guess emphasizes just how important fullbacks are in football these days (and makes you question why we have so many quality left backs but so little right backs). Which reminds me of an obvious point I bring up like all the time – we seriously need a good, natural right back soon, and JHS certainly isn’t a long term solution to this problem. Remember that JHS isn’t naturally a RB (hell even Cha Du Ri was converted from striker… and Song Jong Kook who occasionally played RB back in the day wasn’t a full time RB either). I’m still hoping Im Chang Woo or Oh Jae Suk can pull through for us. And here’s a fun one: our very own reggae boyz (reggae musicians) Ha Dong Hoon (Haha, who you probably know from either Running Man or Muhan Dojeon) and Cho Sung Jin (Skull) were attending the game. 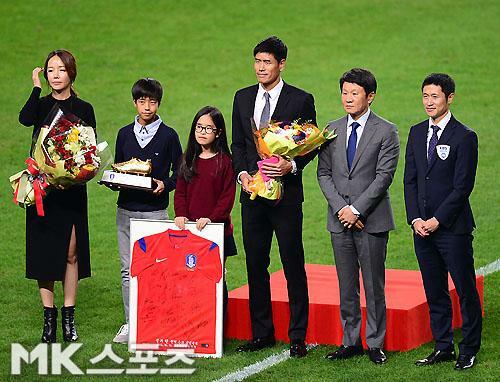 Comedian Park Myung Soo was also there to celebrate (and DJ for) Stielike’s anniversary as KNT coach. It was actually really funny to see Haha and PMS (Muhan Dojeon buddies) go at it during the game, and it was heartwarming to see how warmly Stielike was applauded by the crowd – he even got a massive bowl/trophy filled with 1000 응원메시지 (idk how to translate that one… motivational messages? idk). The link to the anniversary vid is right here – I highly suggest you watch this one. Aside: I CAN SPEAK SPANISH TOO (Level 5 certified and studied in Spain for a summer), why the hell am I not translating for Stielike right now? What am I doing studying down here in the depths of Bass Library? Seol Ki Hyun has officially retired and moving into management – here are some pictures from his retirement ceremony. He was quoted as saying that he was very happy with his career and that now he will focus all his efforts into management. I will always remember this guy – not only did he have a decent European career at a time when Koreans in Europe were not common, but also scored one of my favorite goals ever: the last minute equalizer against Italy. Let’s wish him luck in the next step of his career! I was kinda surprised at the 3-0 win but not complaining haha. Love this win. Korea is looking good. Ji finally scored too. I became a huge fan of Seol after his 2002 world cup performances. Tall, light, quick with a powerful shot, he could have been useful for any team.